Barbie and the Diamond Castle was produced in 2008. A charming Barbie movie. It has great songs and music, some people bought the soundtrack after watching this movie. Sensitive kids might be a little scared from some scenes. The movie is a good example of friendship, kids will learn that friendship worth treasure. Have fun. How to Watch Barbie and the Diamond Castle (2008) Barbie Film For Free No Download, No Surveys and 100% Free? 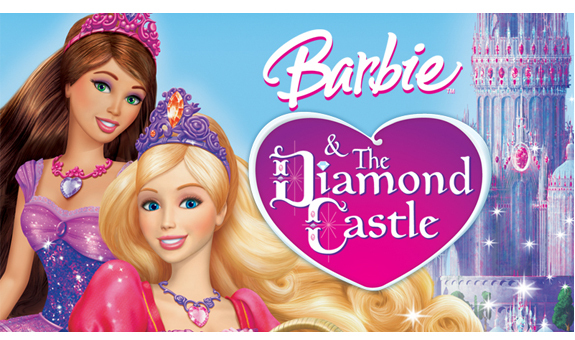 Click on the arrow button at the far bottom-right corner of the video player (stream) to play Barbie and the Diamond Castle full film at full-screen size. Please let me know via comments if the stream is working or not. 89 Responses to "Watch Barbie and the Diamond Castle (2008) Movie Online For Free in English Full Length"
Barbie and the Rockers: Out of This World (1987) and Barbie and The Sensations: Rockin' Back to Earth (1987) have been added to the list. Lilith, it works fine on my android phone. Your movies rock! Don't listen to haters and keep uploading! Why does almost all your Barbie movies don't load or said its not uploaded yet??? There are children on this website watch your language! can you add barbie and her sisters in a pony tale ?? plss..
why does it play then stop to load ??? and it takes so long!! i love this movie becuz my life also hav like this story! i cannot play it with fullscreen mode ? Admin can you add barbie and her sisters in a pony tale please!!!!!!! I freaking love this website… so thankful you made this site!! very very very very very very nice movie!! You stink why don't you just stop being a hater! Can you please correct your grammar no one can understand it proper grammar is this is the best movie i've watched! Liana and alexa could be sisters! Because they look alike and they live together! It's too bad that they're not though! It is called barbie and the popstar! Sounds like that's your problem not admin's problem! Don't you hate it when it keeps stopping and sttopping and then it says: "sorry cannot play video and makes me angry and it's almost over because i'm the type person that if i start something i like to finish it. Don't you? Hello,I want to watch this movie but it only works for a few seconds then it doesn't show me the movie anymore. It just stops and I know I have let it to load for a long time. My wifi is fine and everything,can you tell me why it cannot be played? I can't find Barbie a camping we will go or Barbie in a pony tail. Admin could you please tell me where they are or 're upload them. Thank you. no words can judge!!!!!!!!!!!!! awesome!!!!!!!!!!!!!!!!!! The loading of the video is too slow. Correct yourself before you correct others. I love the movie oh and anonymous its Barbie the princess and the popstar.